Discover Hidden Garmin nüvi 2450 Tricks You're Missing. 28 Tips From the GPS Experts! You're About to Unleash the Full Potential of Your Garmin nüvi 2450! ExpertGPS is GPS map software for your Windows computer, tablet, or laptop. ExpertGPS makes it easy to transfer waypoints, routes, and tracks, as well as GPS, GIS, and CAD data, to and from your Garmin nüvi 2450. Thousands of businesses and GPS users depend on ExpertGPS mapping software to upload and download Garmin nüvi 2450 waypoints, routes, and tracks, make maps of their GPS data over seamless USGS topo maps and aerial photos, and convert and transfer Garmin nüvi 2450 data to and from Excel, Google Earth, ArcGIS, and AutoCAD. We've collected dozens of tips and tricks designed to save you time and money when mapping with your Garmin nüvi 2450. ExpertGPS can transfer Garmin nüvi 2450 waypoints, routes, and tracks through your computer's USB port. It only takes a second or two to download all of the data from your Garmin using ExpertGPS. Transfer data back to your Garmin nüvi 2450 with a single click. Upload waypoints, routes, and tracks to your GPS and print a matching map out to take with you into the field. ExpertGPS even lets you upload Excel, Google Earth, CAD, and GIS data to your Garmin nüvi 2450! Your Garmin nüvi 2450 has limited storage space for waypoints, routes, and tracks. Once you reach that limit, your GPS can't hold any more data. Smart ExpertGPS users have figured out how to eke out every last bit of memory space on their Garmin GPS receivers. Before each outdoor adventure or visit to a project site, they use ExpertGPS to back up the contents of their GPS, and then clear the GPS data memory. They can then download as much data as possible onto their GPS (leaving some room for GPS data collection out in the field). When they get back, they use ExpertGPS to upload all of their Garmin waypoints, routes, and tracks onto their computer and save it. Once they've backed up the new data from their GPS, they can clear the memory again, keeping their GPS ready for their next trip. Backup your nüvi 2450 waypoints, routes, and tracks by using ExpertGPS to transfer them to your laptop or desktop computer. Now you've got a safe back-up of all of the important data on your nüvi 2450, and use ExpertGPS to find and create new waypoints, routes, and tracks to download to your Garmin GPS. Before you update your Garmin nüvi 2450 firmware or install a custom basemap, Garmin recommends that you backup all of your GPS data. ExpertGPS gives you the peace-of-mind that your Garmin nüvi 2450 data is always safe. View your Garmin nüvi 2450 waypoints, routes, and tracks over USGS topo maps and aerial photos. These are actual 1:24000 scale topographic maps from the US Geological Survey, giving you much more terrain detail than the maps that came with your Garmin. Why waste time entering new waypoints on the tiny screen of your Garmin nüvi 2450? ExpertGPS can do it 5x faster! Use the New Waypoint dialog in ExpertGPS to create new waypoints and POI listings for your Garmin GPS. As you type, ExpertGPS automatically suggests the best possible name for this waypoint on your GPS. 1. Calculate area by walking a perimeter with your GPS. ExpertGPS calculates the acreage enclosed by your Garmin nüvi 2450 tracklog. 2. Calculate area by marking GPS waypoints at the corners of a field or parcel. In ExpertGPS, connect those waypoints into a route, and the acreage is automatically calculated. 3. 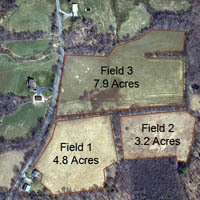 Calculate area by tracing over a map or aerial photo. Use the Track Tool in ExpertGPS to trace the property boundary or field, and let ExpertGPS calculate the number of square feet it encloses. Your Garmin nüvi 2450 can hold 1000 waypoints. Waypoints on the Garmin nüvi 2450 can contain up to 30 characters. Waypoint comments (notes) can contain up to 255 characters. How long would it take you to enter all of those waypoints by hand into your GPS? ExpertGPS will save you hours on this one task alone! GPS coordinates are easy to mis-type. Using the Waypoint Tool in ExpertGPS to create new waypoints reduces the chances of making a mistake when manually entering coordinates on your GPS. ExpertGPS takes care of all of the coordinate conversion and datum shifts when communicating with your Garmin nüvi 2450, further reducing errors. Create routes the easy way! The Garmin nüvi 2450 can hold 100 routes, each containing up to 250 turns or stops. ExpertGPS lets you build up long routes quickly - just click waypoints one-by-one on the map to connect them into a route for your Garmin nüvi 2450. Route names on the Garmin nüvi 2450 can contain up to 30 characters. ExpertGPS makes it easy to rename and organize your routes. Did you know you could trace roads, trails, and other features on the maps in ExpertGPS, and send them directly to your Garmin nüvi 2450? This is a quick and easy way to keep you on-track when out in the field. Poor GPS satellite reception can cause all sorts of errors in your Garmin nüvi 2450 tracks. Use the advanced track editing tools in ExpertGPS to correct spikes and blips caused by intermittent GPS multipath errors. You can even select an entire segment of your GPS track and drag it right back to its correct location on the map! The Garmin nüvi 2450 can hold 11 tracks. Saved tracklogs on the Garmin nüvi 2450 can have up to 250 trackpoints. The active tracklog holds 99999 trackpoints. Track names on the Garmin nüvi 2450 can contain up to 30 characters. You can spend hundreds of dollars on dedicated camera hardware and cables to geotag your photos. Or, you can do it for free, using ExpertGPS. ExpertGPS automatically matches up the timestamps on your digital photos with the times recorded in your Garmin nüvi 2450 track log. It just takes a few seconds when you get back to your desk to have ExpertGPS automatically geotag your photos. Photos geotagged using ExpertGPS are %100 compatible with flickr.com, Google Earth, and any other geotagging software or Web site. ExpertGPS lets you quickly view, change, or batch-edit your photo metadata. Select all the photos for the day, and quickly add the city, state, and location in which they were taken. Add and remove keywords and descriptions. View shutter speed, aperture, and other camera settings. Still using paper forms, or typing data into your GPS piece-by-piece? With your digital camera around your neck, Garmin nüvi 2450 in your backpack or in your vehicle, and ExpertGPS back at your desk, you can gather data on the move. There's no need to mark waypoints as you collect data - just snap photos at each site. ExpertGPS can create geo-referenced waypoints for your report from each photo you took along the way, and attach your photos to each waypoint it creates. Need to convert NAD27 lat/lon to WGS84 UTM? ExpertGPS does it automatically. Enter coordinates in any format, in any datum. To convert Garmin nüvi 2450 coordinates to any other format, just select that format in ExpertGPS. All of your data is automatically reprojected to the new format and datum. ExpertGPS Pro lets you work with data in any US State Plane Coordinate System (SPCS). Even though your Garmin nüvi 2450 doesn't natively support SPCS, you can use ExpertGPS Pro to convert data back and forth between state plane coordinates, lat/lon, and UTM. ExpertGPS converts addresses to GPS coordinates with its built-in address geocoder. 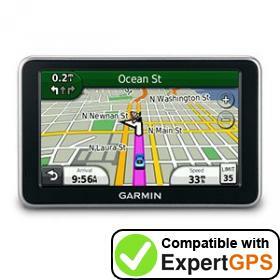 Enter any address in the US (or in several dozen other countries) and ExpertGPS will bring up a map of that location and create a GPS waypoint you can send to your Garmin nüvi 2450. ExpertGPS makes it easy to update your GIS database with GPS data recorded in the field. Simply mark waypoints or record a tracklog on your Garmin nüvi 2450, and then use ExpertGPS to upload your GPS data and export it as a shapefile. And you can Send GIS layers to your Garmin nüvi 2450 as well.